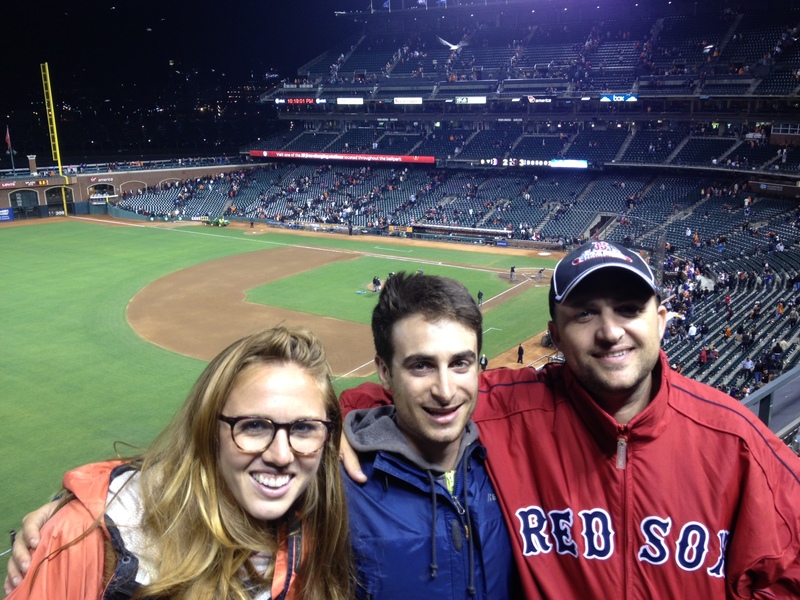 We went to a Giants game. It was incredible. There’s something really great about going to a huge stadium full of people, eating hotdogs, drinking soda, dancing with strangers and enjoying a professional sport. It’s what I imagined people felt when they went to the coliseum (minus the hotdogs, soda, dancing and baseball). We took Muni to the game, and during the ride we were discussing what foods to get. I felt hotdogs, carmel popcorn and beer would suffice and Hayley wanted nachos. “Nachos!? No, nachos are too ‘public pool snack-bar’ for me”, I said. Then, the guy in front of us turned around and said, “to be fair, carmel corn is very circus-y”. He went on to tell us about AT&T Field, how bad the nachos were and about where to find the best hotdog (it was a Chicago Dog from a tiny stand behind home plate). We never exchanged info, or bothered to find out his name, but he was really nice. He was a Red Sox fan and when I told him I was a Yankees fan he immediately retracted all the information he had given me, “actually the best food is in the parking lot…” Cool dude. Then he said, “the Garlic Fries are the best, you gotta get those!” When we got to 16th & church, he said he was stopping home and then running to the game. When we got to the stadium we immediately got Garlic Fries, we got a huuuuge soda, and we got the Chicago Dog- all of it was beautiful. It was like a symphony of flavors swimming in our mouths as we bathed in the sun and pretended that our seats were close to the field than they really were. I’m not a Giants fan, I don’t really know anything about baseball, but it’s nice to go to a ballpark. High fiving fans, taking photos and looking down on the empty field like, I inhaled and thought, “…baseball is my life”. It’s not, but for a second I felt at home in a foreign place. We got to our seats, far away from where we were, sat, and enjoyed the game. Great game. It came down to the bottom of the 9th, bases loaded, 2 outs- 4 balls and…GIANTS WIN. The stadium erupted. People cheering, hugging, dancing. Smoke cannons going crazy, you’d think we just won a war or something. After the win, people quickly sobered up and poured out. Very quickly. We had been meaning to beat the rush but alas we were stuck in the middle of it. Instead of racing out we decided to stay back. We wanted to linger and enjoy the stadium. As we were standing admiring the tractors that had quickly came out to manicure the field, a guy yelled up to me. “Get out of here! You’re not supposed to be here.” I was confused. Thinking he was talking to someone else, he yelled again. “NOOO! YOU are not welcomed in THIS stadium! LEAVE!” At this point I thought about just walking out, ignoring the guy and categorizing his words in the ‘don’t worry, it’s a drunk dude’ category. Then he said, “NO YANKEES FAN! And especially no people who eat nachos!” That’s when it clicked. It was the guy from the Muni. There were over 45,000 people there and the one guy we randomly met on our way to the game, was sitting 3 rows in front of us. His name was Matt. His team lost, but he was in good spirits. We thanked him for the tips and then took a photo. This place doesn’t feel like a city sometimes- it feels like a small town, where everyone knows everyone and there are people you want to avoid, but there are also some people who will turn around on a Muni and give you the ins and outs of a stadium. 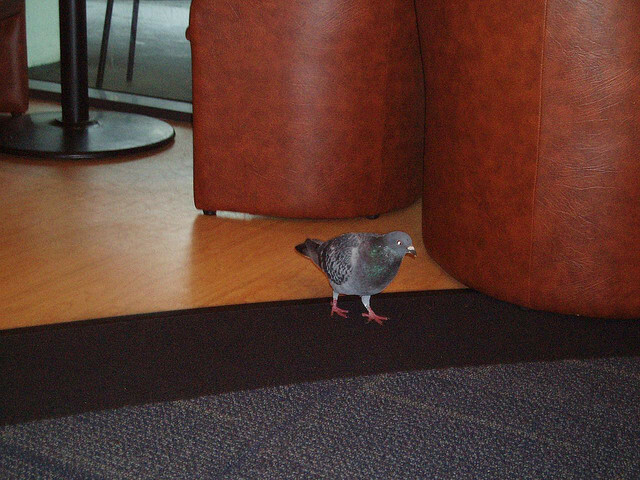 A pigeon walked into a coffee shop, it didn’t fly. It came in wanting a muffin, some water and a cup of their house roast. It didn’t disturb anyone; it walked under two elderly men with canes, but they didn’t see the pigeon, so that doesn’t even matter. When it walked directly up to the counter, and evaded the line, it was acting a little cocky. Now people in the coffee shop were exchanging nervous glances. Who is this pigeon? Then, a man in an apron walked directly at the pigeon. He didn’t speak, he just had a menacing grin on his face. The pigeon, not wanting to get stepped on, moved out of the way. But the grinning man kept coming. The pigeon had enjoyed the coffee shop’s muffins, bagels and pastries for years! And now this! Not wanting to make a scene- the pigeon walked, it didn’t fly- out the door. The man stood at the entrance, staring at the pigeon. It was a mean stare. The kind of stare The Big People give you when you’re not welcome. The pigeon didn’t do anything wrong. That coffee shop just lost a good pigeon.